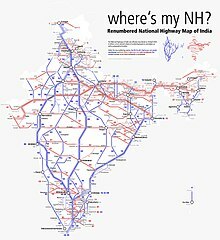 The National Highways Authority of India (NHAI) is an autonomous agency of the Government of India, set up in 1988 and is responsible for management of a network of over 50,000 km of National Highways out of 1,15,000 km in India. It is a nodal agency of the Ministry of Road Transport and Highways. NHAI has signed a memorandum of understanding (MoU) with the Indian Space Research Organisation for satellite mapping of highways. Nagendra Nath Sinha (IAS), is the present Chairman of NHAI since March 2019. The NHAI was created through the promulgation of the National Highways Authority of India Act, 1988. Section 16(1) of the Act states that the function of NHAI is to develop, maintain and manage the national highways and any other highways vested in, or entrusted to, it by the Government of India. In February 1995,NHAI came into operations and was formally made an autonomous body. It is responsible for the development, maintenance and management of National Highways, totaling over 92,851.05 km (57,694.97 mi) in length. The NHAI is also responsible of the toll collection on several highways.Yogendra Narain was the first Chairman of NHAI in 1988. He is a retired IAS officer of Uttar Pradesh cadre. The NHAI has the mandate to implement the National Highways Development Project (NHDP). The NHDP is under implementation in Phases. Phase I: Approved in December 2000, at an estimated cost of INR 300 Billion, it included the Golden Quadrilateral (GQ), portions of the NS-EW Corridors, and connectivity of major ports to National Highways. Phase II: Approved in December 2003, at an estimated cost of INR 343 Billion, it included the completion of the NS-EW corridors and another 486 km (302 mi) of highways. Phase IIIA: This phase was approved in March 2005, at an estimated cost of INR 222 Billion, it includes an upgrade to 4-lanes of 4,035 km (2,507 mi)of National Highways. Phase IIIB: This was approved in April 2006, at an estimated cost of INR 543 Billion, it includes an upgrade to 4-lanes of 8,074 km (5,017 mi) of National Highways. Phase V: Approved in October 2006, it includes upgrades to 6-lanes for 6,500 km (4,000 mi), of which 5,700 km (3,500 mi) is on the GQ. This phase is entirely on a DBFO basis. Phase VI: This phase, approved in November 2006, will develop 1,000 km (620 mi) of expressways at an estimated cost of INR 167 Billion. Phase VII: This phase, approved in December 2007, will develop ring-roads, bypasses and flyovers to avoid traffic bottlenecks on selected stretches at a cost of INR 167 Billion. NHAI helps in implementing Special Accelerated Road Development Programme for North Eastern Region (SARDP-NE); a project to upgrade National Highways connecting state capitals to 2 lane or 4 lane in north eastern region. The Golden Quadrilateral is a highway network connecting many of the major industrial, agricultural and cultural centres of India. A quadrilateral of sorts is formed by connecting Chennai, Kolkata, Delhi and Mumbai, and hence its name. The largest highway project in India and the fifth longest in the world was launched in 2001 by Prime Minister of India Atal Bihari Vajpayee and was completed in 2012. It is part of the first phase of the National Highways Development Project (NHDP) and consisted of building 5,846 km (3,633 mi) four/six lane express highways at a cost of ₹600 billion (US$8.3 billion). The North–South and East–West Corridor is part of the second phase of the National Highways Development Project (NHDP) and consists of building 7,142 kilometres (4,438 mi) of four/six lane expressways connecting Srinagar in the north and Kanyakumari in the south, Porbandar in the west and Silchar in the east, at a cost of US$12.317 billion (at 1999 prices). The Ministry of Road Transport and Highways (MoRTH), Government of India has promulgated Green Highways (Plantations, Transplantations, Beautification and Maintenance) Policy – 2015 on 29 September 2015 to develop green corridors along National Highways for sustainable environment and inclusive growth.The policy envisions"development of eco-friendly National Highways with participation of the communities, farmers, NGOs, private sector, institutions, government agencies and the Forest Departments for economic growth and development in a sustainable manner." Under the aegis of the Policy, development of green corridors is proposed along developed and upcoming National Highways in the width available in existing Right of Way (ROW) in the form of median and avenue plantations. Roadside plantations have immense potential to enhance the green cover of nation and generate employment opportunities for rural community. Green Highways Division - under National Highways Authority of India (NHAI) has been entrusted with the task of planning, implementation and monitoring roadside plantations along one lakh km network of National Highways which would in turn generate one lakh direct employment opportunity in plantations sector in next ten years.For effective project planning, implementation and monitoring GHD has developed Guidelines and Vision Document. A 2012 report prepared by the World Bank’s Institutional Integrity Unit alleged that fraudulent and corrupt practices were being followed by Indian contractors working on national highway projects funded by it, and sought a thorough investigation into the matter. The report also alleged that contractors paid bribes and gifts, including gold coins, to "influence the actions" of officials and consultants of the National Highways Authority of India. Local bodies and major road owners - including PWD and National Highways Authority of India (NHAI) - were criticized for depending on old technologies and outdates specifications for building and relaying roads. In March 2010, Government of India issued a new list of numbered routes with rationalized and systematic numbering. The odd numbered routes are drawn horizontally, with numbers increasing from northern to southern parts of India. The even numbered routes are, similarly, drawn vertically going north to south, with numbers increasing from eastern to western parts of India. Ministry of Transport and NHAI has launched the green highways program.in 2016. ^ a b "NHAI Official Website". NHAI. Retrieved 9 January 2016. ^ "Sanjeev Ranjan named Road Transport Secretary, N N Sinha to be NHAI chief". 4 March 2019. ^ "NHAI List of Board of Directors". NHAI. Retrieved 9 January 2016. ^ "NHAI Road Network". NHAI. Retrieved 9 January 2016. ^ "NHAI signs MoU". Business Standard. Retrieved 9 January 2016. ^ "NHAI plans toll collection at Kaniyur shortly". The Hindu. Retrieved 9 January 2016. ^ "SARDP-NE" (PDF). Retrieved 15 June 2011. ^ "Golden Quadrilateral Highway Network". Road Traffic Technology. Retrieved 15 June 2011. ^ "Indian Road network". National Highways Authority of India (NHAI). Retrieved 15 June 2011. ^ "NHDP programme". National Highways Authority of India (NHAI). Retrieved 15 June 2011. ^ a b "Express Exclusive: World Bank cries fraud, graft in highways projects". Indian Express. ^ "Corporation to focus on public transport".